The new European Cycling Route EuroVelo, also called the Iron Curtain Trail (ICT), passes through 20 countries from the north of Finland to Turkey and covers 8800 km. The total length of the 13th ICT route in Latvia is 562 km. About half of the route consists of asphalted roads with low intensity traffic; bike paths are mainly available in the cities – Liepāja, Ventspils, Jūrmala, Rīga, Saulkrasti and Salacgrīva. Most of the path surface is asphalt, with an exception of Nature Parks and reserves, where such a surface is forbidden, and you can even bike next to the sea! In addittion to Latvia, we also offer you to experince the South Estonia (up to Parnu) and North Lithuania (from Klaipeda). The route mainly passes along the seaside and therefore has very small differences in height. It should be taken into consideration that part of the route consists of sand covered roads. The non-asphalted parts of the route in North Latvia are marked with temporary yellow EV13 signs and are mainly recommended for avoiding the intensive traffic. 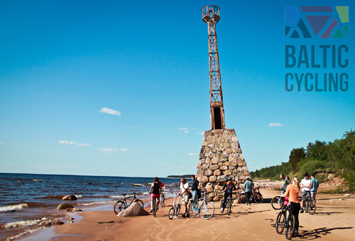 Book through balticcycling.com or simply call us! We will send you our offer afterwards!